Well what a festive bunch we are here! Lesley our hostess for the CQAL this month has made cinnamon rolls (and I don't know how many she has eaten, but she's only having a plate of fruit later on - jus' saying); Lynn has got festive snow; there's baking afoot at Sharon's; and loads of Christmas projects on the go! What a great day! And Lesley is also kind enough to sort out a fabric giveaway - whoop whoop! All you got when I hosted was a recipe and me banging on about our family Christmases a zillion years ago but before everyone hotfoots over to Lesley's, I must show you how I'm getting on with part 3 of our Festive Mystery Quilt. 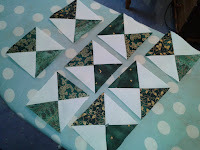 I am having to concentrate VERY HARD INDEED to get my quarter square triangles right - I'm a bit heavy handed with the iron and tend to pull the squares a little out of shape when pressing the seams, so trimming takes lots of care! After I've checked how everyone is getting on, I must hurl a bolognase together to simmer for dinner, so I need to run up the road to buy onions - and yes, it is now raining. The good news is that it is after 6pm here, so more than time to pour a glass of sherry to keep me company in the kitchen! Hurrah! Lovely pointy points in the middle! Well done you. Your QSTs look wonderful. I love the colour contrast you have in them, and, as Bilbo said, your points are brilliant. It all comes good in then end then, Lesley? Good! Those blocks look good to me. I really love the greenish (?) fabric. Very pretty. Enjoy your sherry and cooking time. The greens are just up my street, Joanna - rich and gold too. The bolognase was fabulous - with enough to put in the freezer to enjoy later on! Bolognase?!?! I'm having dinner at your place. Okay maybe not, because DH is cooking steak on the grill, but who needs the sherry with points like that? Now if there is sherry in the kitchen, careful with the rotary! Lovely block units. My safety is assured with BilboWaggins drilling me repeatedly in health and safety with regard to alcohol and cutters, Sharon - I had the merest sip whilst trimming the blocks!